Justice Binta Nyako of the Federal High Court sitting in Abuja, on Tuesday ordered the Department of State Service (DSS) to allow the detained Senator representing Abia South Senatorial District, Senator Eyinaya Abaribe access to his lawyers, Nigerian Tribune has reported. The order was given following an oral application made on his behalf by his counsel, Chukwuma-Machukwu Ume (SAN), praying a court order, for the release of Abaribe, who was picked up by the DSS last Friday for undisclosed reasons. Abaribe is one of the sureties who guaranteed the bail of the leader of the proscribed Indigenous People of Biafra (IPOB), Nnamdi Kanu. Kanu’s where-about has remained unknown after his disappearance since the military invaded his home in Abia State last October, prompting the prosecution counsel, Sylvanus Tahir to ask the court to revoke Kanu’s bail, and that the sureties forfeit their bail bond or be remanded in prison custody until they produce Kanu. When the matter came up yesterday, before Justice Binta Nyako, Abaribe’s counsel, Ume told the court that his client, who was arrested last weekend over his role in the IPOB matter, was brought to court in chains by the DSS. 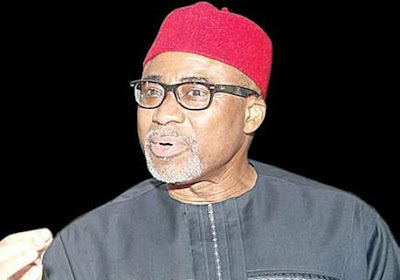 While stating that Abaribe, since his arrest has been held incommunicado by the security agency without been charged to court, Ume said Abaribe’s arrest is capable of jeopardising the trial. He then urged the court to order the release of Senator Abaribe from DSS custody. In her response, the trial judge, Justice Binta Nyako said, since the arrest of Abaribe was not a matter before him, there is nothing the court could do, adding that in a situation such as this, Abaribe’s counsel ought to know the next step to take. However, following much pleading by Abaribe’s counsel, Justice Nyako requested for the DSS official who brought Abaribe to court and ordered that he be allowed access to his lawyers. “Allow him to have access to his counsel, you cannot hold him incommunicado. No matter what reason, he has been arrested, allow him access to his lawyers,” the court ordered. ‎Recalled that Senator Abaribe, a Jewish Priest, Ben El Shallom and an Accountant, Tochukwu Uchendu, had all stood sureties for Nnamdi Kanu in the sum of N100 million each. However, following the disappearance of Kanu and his subsequent failure to attend his trial, the Federal government, through the prosecution counsel, Shuaibu Labaran applied and secured a court order directing Kanu’s sureties to ‎produced him in court or to show cause while they will not be sent to prison. Earlier, Ume and counsel to the Jewish Chief High Priest‎, Immanuel El-Shalom, the second surety, Aloy Ejimakor informed the court of a motion they both filed challenging the jurisdiction of court to entertain the matter on the grounds that the order served on their clients to show cause why they should not forfeit their bail bond for Kanu or be remanded in prison custody did not comply with the law. They, therefore, urged the court to set aside the order for want of jurisdiction. ‎Although the prosecution counsel indicated his intention to respond to the applications orally on point of law, since he was just been served in court, the matter did not proceed following the inability of the applicants to effect service on counsel to Nnamdi Kanu, Ifeanyi Ejiofor. It was subsequently adjourned till November 14, 2018, for hearing. Meanwhile, one of the surety to Nnamdi Kanu, Tochukwu Uchendu, has filed a motion for an order of court directing the police to arrest and produce Nnamdi Kanu to court. In a motion on notice dated June 25, 2018, Uchendu through his lawyer, Frank Chude further asked the court for an order suspending his obligation on the bond until the whereabouts of Nnamdi Kanu is established. The motion which was brought pursuant to section 174 (A) and (B), 177 and 179 of the Administration of Criminal Justice Act, 2015 and section 36 of the nation’s constitution, was rooted on four grounds. In a 23 paragraphs affidavit in support of the motion, ‎Uchendu predicated his motion on the grounds that the court had granted the 1st defendant (Kanu) bail on the 25th day of April 2017. An affidavit deposed to by Uchendu stated that after the invasion of the residence of Kanu by the Nigerian Army on September 14, 2017, he has not been seen in the public since. “I am unable to communicate with the 1st defendant and his whereabouts unknown to me. Uchendu averred, “That Kanu has not been seen in public since September 14, 2017, when the agents of the state (soldiers) invaded his house in Isiama Afaraukwu, Abia state.